Fit Tennis – Saturdays from 9:30 - 10:45 a.m.
Thursday Walk-in Co-ed Drill – $10 drill per person | starts Thursday, January 18 | 9:00 - 10:15 a.m.
Sunday Walk-in Co-ed Drill – $10 drill per person | starts Sunday, January 21 | 1:00 - 2:30 p.m. Tiny Tennis (2-6 yrs.) – Saturdays at 11:00 & 11:30 a.m. | Mondays at 4:30 p.m.
Intermediate Tennis – Mondays & Fridays (8-12 yrs.) | 5:00 - 6:00 p.m.
Advanced Tennis – Tuesday, Wednesday, Thursday (11-18 yrs.) | 4:30 - 6:30 p.m.
Tennis is a year-round sport on our three indoor & three outdoor hard courts. Our tennis staff has developed programs and club leagues that benefit players of all skill levels. Whether you are seeking fun, weekend play or competitive tournament play, our programs satisfy each individual desire. Nate Malone began playing tennis in Abilene, TX and continued pursuing the sport when his family moved to Searcy, AK. Nate was ranked as a top 10 UTSA age group tennis player in Arkansas for 8 years. While in high school, Nate played football, basketball and was a three-time runner up at No. 1 singles in tennis. Nate played college tennis in his hometown at Harding University and then at an NAIA school. While in college, Nate’s tennis honors included two-time district champ at No. 1 doubles, two-time district champ at No. 4 singles and 4-time NAIA National Championship Tournament qualifier. Nate has 6 years of tennis teaching experience and believes tennis should be a fun journey of self-discovery. Jonathan Kraft grew up playing tennis in the Oklahoma City area. He began playing when he was in the third grade and has been playing non-stop ever since. Through his time competing in the Juniors, Jonathan was ranked as high as top 5 in the state and never lower than the top 15 from 10 and under through his time in the 18 and under age group. In the 16 and under age group, he rose to top 20 in the Missouri Valley, and at one point, he was ranked 11 in Prince’s Hot 100 Junior ranked players in the nation. Jonathan attended Bishop McGuinness high school where he won three state championships: one at singles, one at doubles and one team championship. Jonathan received honorable mentions and 2nd team all-state his first three years in high school then in his senior year he was honored with 1st team all-state recognition. 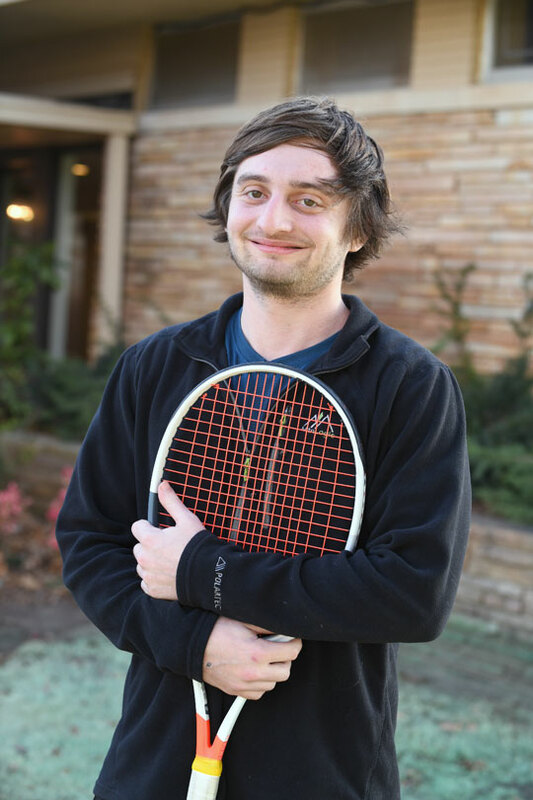 In college, Jonathan furthered his knowledge of tennis by completing his USPTA certification and attending workshops in Oklahoma and other states. As a college student he played many 4.5 and 5.0 USPTA league tennis matches. In 2015, his 4.5 league team was the best in the Missouri Valley, winning their section and advancing to the National Championships. Jonathan recently adopted a 13 week-old golden retriever named Yogi that, believe it or not, loves tennis balls!